Markets 101: What are Bull and Bear Markets? In any securities market, traders make their money by watching and analyzing market trends and patterns, analyzing the effect of fiscal policies, among other strategies. These markets could be those of stocks, commodities, currencies, bonds, futures and many more. There are three different patterns that a market can portray. These are; an upward pattern, creating what is known as a bull market, a downward pattern, creating what is known as a bear market and a sideways zigzag pattern creating what is known as a sideways market. History has it that these different patterns were named after particular ways in which animals perform an attack on their enemies. As such Bulls when charging to attack an enemy, they do so by lowering their heads and with their horns lifted, they aim at lifting the enemy. 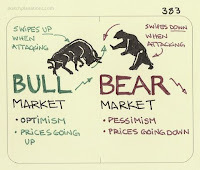 A bullish market is therefore one that portrays characteristics of an upsurge in prices. Such a market would suit both sellers and buyers. 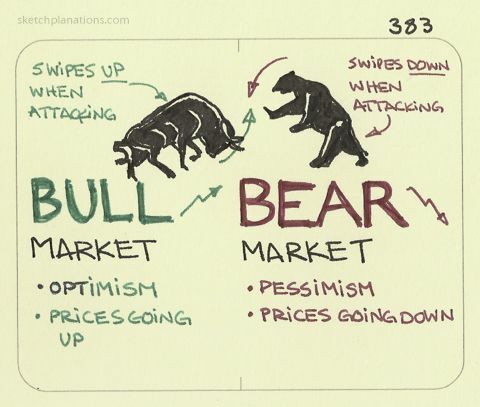 A bear market on the other hand is derived from how a bear attacks its enemy. A bear using its paws, lifts them up and swipes them downwards upon the given prey. A bear market is therefore one where prices are plummeting akin to the famous stock market crash of 1929. Such a market would be primarily a sellers’ market but professional investors have mastered the art of buying and selling at any pattern by shorting. A sideways market is not aligned to any animal but it is one that portrays a zigzag pattern. It takes the middle ground between the bear and the bull market. It is my hope that you found this helpful.